Manchester City have reached an agreement to sign Bacary Sagna from Arsenal on a three-year deal. The France right-back spent seven years at Arsenal but his contract expired at the end of the season. And now City have confirmed the 31-year-old as their first major addition to manager Manuel Pellegrini's Premier League title-winning squad. Sagna, who will join the Blues after the Brazil World Cup, posted a farewell message to the Gunners on social media. He has already been handed the same number three shirt he had at Arsenal, last worn at City by former Brazilian defender Maicon. 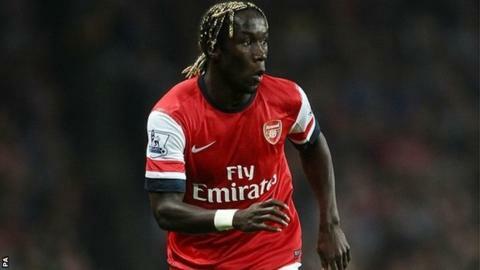 Gunners boss Arsene Wenger paid Auxerre £7m for Sagna in July 2007. He went on to make 284 appearances for the north London outfit and was twice voted into the PFA Premier League team of the year. However, he did not win a trophy until last month, when he featured in the 3-2 FA Cup final victory over Hull at Wembley. "Everyone at Arsenal Football Club would like to thank Bacary for his fantastic contribution and wish him all the best for the future," said a club statement. Sagna becomes the fifth player to leave Arsenal for City in recent times, following on from Emmanuel Adebayor, Kolo Toure, Gael Clichy and Samir Nasri. He will link up with Pellegrini's squad at some point on their pre-season tour of the United States, providing competition for popular South American right-back Pablo Zabaleta. Although City were the subject of Uefa sanctions last month when they were found guilty of breaching Financial Fair Play regulations, with Joleon Lescott set to move on this summer and doubts over Jack Rodwell and Scott Sinclair, the club believe they have sufficient flexibility within their budget to make further additions. Porto midfielder Fernando, 26, is also expected to complete a move to the Etihad Stadium in the coming days.